Do you think people should be allowed to vote before they are legally an adult? Teenagers all over Oregon are in favor of the new bill to let citizens vote at the age of sixteen. They are curious as to why they can drive a car and pay taxes, but do not get a say in who is the next president. "We need to be able to take our work to the ballot and protect the policies we’re working so hard to pass,” says a Salem High school student Maria Torres. “We’re experts of our own experiences,” said Connor Gabor. I asked some students at Black Butte School what their opinions are. “I think it’s good because more people would be able to vote,” says Lily. “It makes teenagers feel important,” Jojo adds. I don’t think its a bad idea. Maybe by allowing teenagers to vote we can have more opinions on politicians. A two year difference isn’t that much, and an eighteen year old is just as likely to believe what their parents believe. 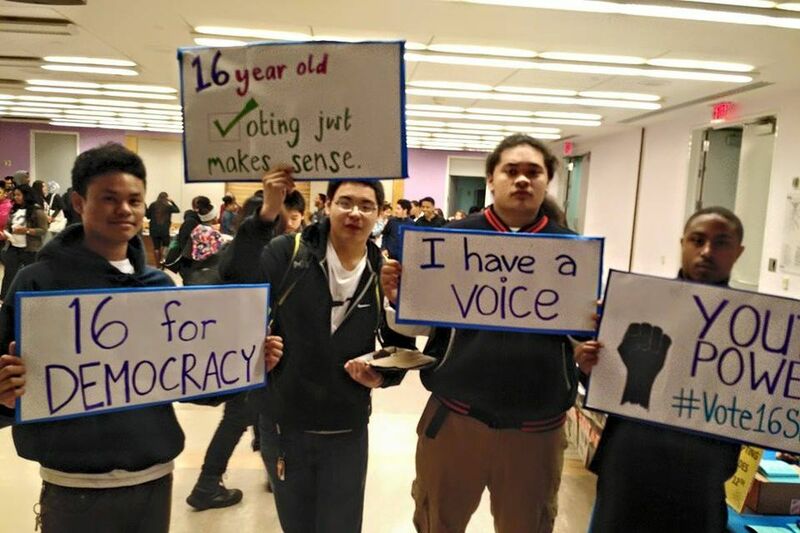 Teens might be more interested in politics if they get to participate. It could also end badly, though, if they didn’t have the right information about the candidates. We could end up electing someone with ill intentions on certain people or America. Even though there are potential risks, the bill would allow many more voters to express their opinions. It’s an interesting idea and it would be cool to see what happens if this bill is passed. The Nugget News published an associated press article on this topic on April 3, 2019. Read it here. The start of the story of Suttle Lake Methodist Camp was in the winter of 1921, when there was a group of young people from Redmond, Madres and Prineville Methodist churches who wanted a new camp. All of them met in Redmond thinking about making a new youth methodist camp. Soon they were led to Suttle Lake. In 1922 the young campers camped along the creek, to decide if they want to make it a new youth camp. Then in 1923 they started to work with the US Forest Service. In the beginning, the camp leaders would camp up by the ridge with tents, along with the campers. In the 1940s they built a kitchen and a dining room with some beds below. The building's name is Pioneer Loge. Later, in 1947 the camp built cabins around Pioneer Lodge. Since those events that have built many more cabins, and some shower houses in the area. They also made a challenge course near the ridge. Thy made a house for the directors and a welcome center. The present directors are Jane and Daniel Petke. They have been the directors for more than 12 years now. They are one of the longest directors to be working there. Pretty recently they have been on a low on staff, with only about five staff, who work to feed and house at most about one hundred and fifty people! The directors do not just help at the camp they also volunteer for Black Butte School! Daniel volunteers as the the Board Chair of the School Board and Jane volunteers for the Parent Teacher Organization. Black Butte School kids visit for a field trip at the beginning of the year. Some years they have done archery and now the tradition is do to team building activities on the challenge course This has been a fun tradition for about ten years. If you want to visit the camp or one of the others you can go to https://suttlelake.gocamping.org/. I hope I see you there! In Sisters, Oregon there is a company called Laird Superfood. It is expanding very rapidly and might soon be the biggest company in Sisters. The owner is named Laird Hamilton. He is famous for high-wave surfing in Hawaii. He started a company because wanted to have healthier coffee and coffee creamer. So he started the company in 2015 for healthier more energetic filled cup of coffee. Since then, Laird Superfood has been doing great and has decided to expand even farther in Sisters. Falconry is old and it is often referred to as the sport of kings. In my article, you will see why. Falconry is hunting with a trained bird of prey on your fist or in the air. In the past, there were certain birds that people hunted with. Here is the list of birds. The emperor would get an eagle, the king would get a gerfalcon, a prince will get a tercal male, a duke got a loch falcon, Earl gets a Peregrin, Barron gets a buzzard, knight gets a sacer and a secret, esquire gets a laner, lady gets a marlin, young man gets a hobby, yeoman gets a goshawk, poor man gets a jercal, a priest gets a sparrowhawk, the holy water clerk gets a musket, knave or servant gets a kestrel. There's obviously some birds that are used more often than others. 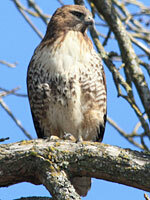 The first commonly used bird is the Red Tailed Hawk, which is native to the area that we live in. The Red Tail is a bird that most people use when they are getting into falconry. You can catch a wide variety of quarry (or prey) with them. The next most common bird is the Harris Hawk. These birds are very social and can be used in a cast, which means two or more people can fly them together. The last is a Peregrine Gry hybrid. Gry are very good flyers and peregrines are native to where we live, so they make a very good falcon for hunting. 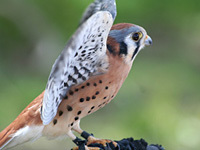 There are two types of birds for beginners: the Red Tailed Hawk and the American Kestrel. Like I have already explained, the Red Tailed Hawk is a very good falconry bird. the Kestrel is very small, at only 3.5 ounces. It is very easy to over feed and that could hurt it. They don't hunt a lot of animals. When you are a falconer you need a lot of equipment to keep your bird healthy. The house that you keep a bird in is called a mew. Mews have lots of room for the bird to do move around. The mews are usually 10 feet by 8 feet. Then they have a room to work with the bird which is also that same size directly outside of the door to the bird. Before you can become a falconer you have to have enough food until you and your bird can go hunt for food. You also need a lot of other equipment like bells to keep track of the bird when it makes a kill. When you get started, you have to take a exam to make sure you know what you are doing. But you can't just walk in to take the test you have to set up a time to take your test. If you pass your test with more than 80 percent to actually become a falconer. You have to have your hunting license and falconry license. After you have to find a master falconer and be their apprentice for two years. There are certain stages that you have to go through to get to the point where you and your hawk can hunt together. The first stage is manning, which is when you get your bird acclimated to people, mostly yourself. This is very important because otherwise the hawk will be scared of people and will fly away. The second stage is training your hawk to come to the fist and get it to eat out of your hand. This means that it trusts you. Then you slowly move farther back to a step then to a jump, then to a short glide then farther and farther away until about 200 feet. Then you can free flight. You can get your bird fit in many ways like training and cutting down until you find your birds best performance weight. Once you get your bird to that weight, make sure you are keeping it at that weight by flying it. You can keep a Red Tail in that weight by going on walks with it. You train Red Tails to follow you from tree to tree. With falcons, you can fly them at the lure. Unless you have had your bird since it was a baby you don’t need to teach it to hunt. With a Red Tail Hawk you hunt many different types of game. But with falcons and short wing hawks, you really only hunt birds even though they can also hunt other animals as well. Despite the differences between short wing hawks, falcons, eagles, and buzzards they are all in the same family, so most of the Raptor family can be used for falconry. Thank you for reading my article now you know more about falconry and I hope you use it to your knowledge in the future. Imagine you're driving in the misty morning and a giant creature wanderers across the road and then disappears into the mist. What was that creature? That creature might have been a Rocky Mountain Elk. Rocky Mountain Elk are hanging around Camp Sherman and Sisters and are moving all the time in a giant herd of about 100+ elk. What are they doing here? They are migrating through Oregon and are trying to find food wherever they go. Then during the Spring, hunting season opens and they split up and go there own ways. That's why it is so hard to hunt these creatures because they are always moving to new places while they are looking for food. These elk are also here to mate. They gather up in large groups and then they fight for a mate. The bulls fight for the females. The winning bull gets to mate with the female(s) depending on how many there are. Then the females leave the pack and give birth to the babies around June. When baby elk are born, they normally weigh about 30 to 33 pounds. During March and April the elk shed their antlers because they are preparing for the summer breeding season. The will grow them back before summer. Why are elk so hard to hunt? This herd is really hard to hunt because there are very few bulls and they are a lot smarter than other younger bulls. Some of them have been around a lot longer and they are adapted to the environment and its surroundings. Another thing is these elk are really scared of humans so they stay out of recreational areas and they are always moving to a different location. So it is very hard to get them in one spot to hunt them. The elk usually go where there is food so they will graze in open fields and grassy pastures as well as lush green areas and may be found roaming through the forest. Overall these majestic creatures are one of a kind and are roaming freely today. 2019 Ski & Ride Program Was a Success! How would you like to spend the whole day at a snowy mountain and snowboard or ski? 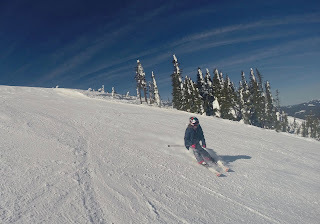 The Black Butte School District does the Ski & Ride program every year and I think it is a fun experience to be at the slopes. It is a special opportunity because most schools don’t get to do this. 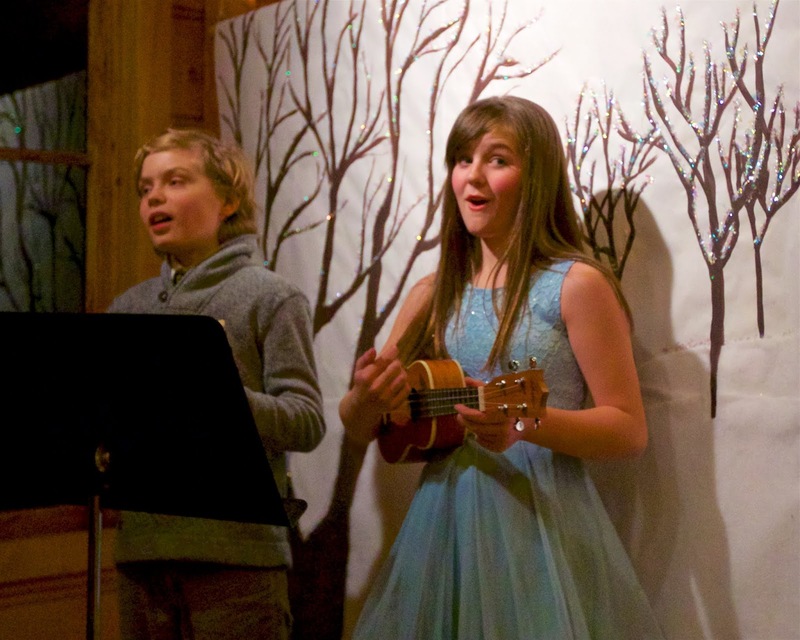 It is a unique way to learn and have fun at the same time. It taught us to be able to ski and snowboard and to be able to do it in the future. This year, we had two snowboard instructors and four ski instructors. The snowboard instructors are Amy & Micah. The ski instructors are Cheryl, Ronda, Donna, and Lorna. All the instructors teach different levels of skiing and snowboarding ranging from "never done it before" to experienced riders. The instructors were happy to be able to do the program with us and to be able to teach all the kids to snowboard and ski. There were eight snowboarders and 20 skiers this year. The ski & ride program is just a fun and educational way to learn and we have fun. We are also an awesome school to be able to do this every year! New year resolutions are very important when it comes to the new year. Some people have goals and some are just for fun. Why are resolutions important? Well when it comes to resolutions people sometimes try really hard to make a difference in life or just the world in general. 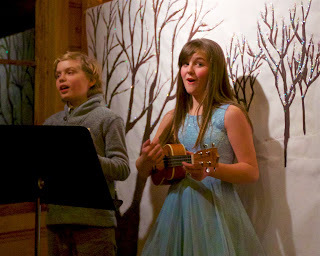 Some people, like Lily (grade 5) think that resolutions are important because, “it helps me through the year." Mr. Sharp says, “it’s kind of like a fresh start for a new year." Emily (grade 7) thinks that resolutions, “help you become a better person." What are some other student's resolutions? “Hit a home run” says Ace (grade 5). “I want to learn more games,” says Zoe (grade K).